You don’t always have to win a bout to become a star. Sometimes you just have to lose it very well. Coming in to 2013, Provodnikov was a name known to some dedicated boxing fans due to regular appearances on Friday Night Fights but he was simply another fringe contender with the name people struggled to spell working the regional circuit. Undoubtedly powerful (as can be seen in his quick dismissal of Jose Reynoso) but also crude and seemingly limited, many observors thought he’d already reached his ceiling, with Mauricio Herrera having already exploited his flaws while winning a narrow decision back in 2011. So while Provodnikov may not have been completely unknown, when Timothy Bradley, fresh from his controversial victory over Manny Pacquiao and thus one of the most talked about men in boxing (albeit not always in a good way), picked him for his next bout it sent a horde of boxing fans rushing to youtube and boxrec to find out quite who this man was and caused many to instantly dismiss him as too crude and too limited for Bradley. Instead we got a fight of the year contender with Provodnikov landing the more hurtful shots… and while the narrow Bradley victory was probably deserved it was clear that a star had been born. That didn’t change in Provodnikov’s other bout in 2013 where he made a mockery of some foolish pundits who thought he might struggle with Alvarado, breaking the tough Mexican-American down over the course of the bout. Entering 2013 Provodnikov was a relative nobody in boxing. Leaving it he’s must-watch TV, the WBO 140lbs champion and a viable opponent (promotional issues aside) for anyone at 140 or 147lbs. Over the past few years 175lbs has been a pretty uninspiring division. For a while it seemed like a retirement home for faded boxers with the likes of Roy Jones Jr, Tarver, Glen Johnson and Hopkins being the big names. Then when fresh blood… Pascal Chad Dawson, Nathan Cleverly, Tavorous Cloud and Shumenov came in despite much promise they were equally uninspiring… both with their perfomances and their choice of opponents. 2013 changed that… and Kovalev has been an integral part of it. Russian born but having spent his whole boxing career in the US, if you’d asked most boxing fans who he was at the start of the year you’d have drawn a blank look. 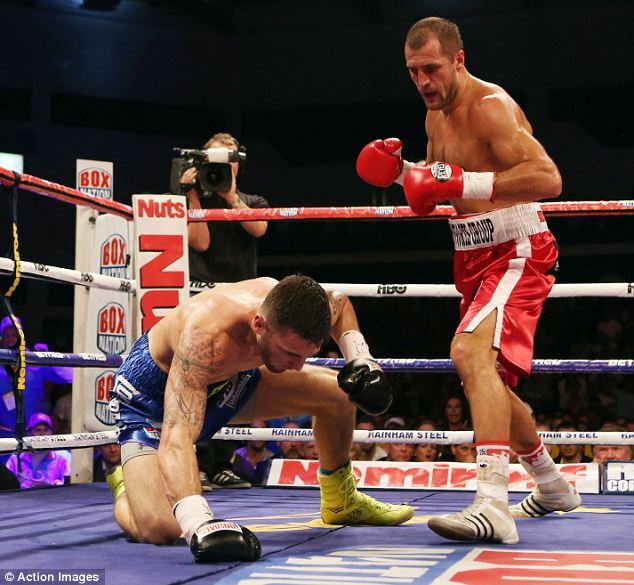 Yet in four bouts and less than 12 rounds of action Kovalev has stamped his authority on the division. Powerful, ultra aggressive and with a huge workrate, Kovalev first broke the respected Campillo, then smashed contender Cornelius White, won a world title by beating up Nathan Cleverly and finished the year by flattening the once highly regarded Ismayl Sillakh. He was brutal, relentless and mesmerising to watch. He has flaws… but so far no-one in recent years have been able to survive his onslaught for long enough to exploit them. As a boxing fans for their dream matches at 175lbs in 2014 and I’d be shocked if Kovalev didn’t feature in a number of them. Porter has long been regarded as one to watch but over the past few years most fans were getting tired of watching the welterweight prospect tread water without stepping up his competition. We knew he could beat the likes of Alfonso Gomez, Anges Adjaho and the shockingly nicknamed “The New” Ray Robinson… and when he closed out 2012 by being held to a draw by faded gatekeeper Julio Diaz and worse, when he appeared unconcerned by this, many wrote Porter off as over-hyped and under-talented… a man who had been exposed and found out and wouldn’t really amount to anything. 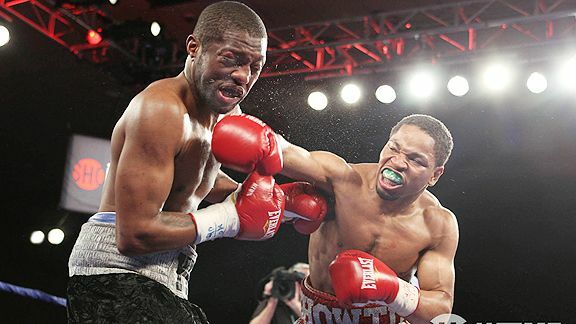 Porter’s 2013 campaign started fairly quietly; he outclassed the limited Canadian prospect Phil Lo Greco and then relatively easily beat Julio Diaz in a rematch but what brings him onto this list is his bout with title holder Devon Alexander. 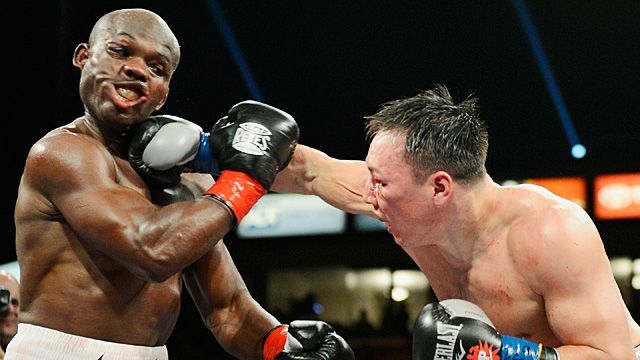 Despite how painful his bouts can be and his tendency to hold, Alexander is a highly effective boxer who held titles at two weight classes, had only lost to Timothy Bradley and was looking to put on an impressive performance in the hope of securing a bout with Floyd Mayweather. Most pundits… myself included… thought Alexander would be too much for Porter. Porter exploded out of the gate against Alexander showing an intensity we’d never seen from him before. He was wild and open but Alexander couldn’t find a way to slow him down, be it by punching him or grabbing him. As the bout wore on Porter slowed a little and Alexander came back into it but by the end the result was clear with Porter winning a close but deserved decision. That bout doesn’t make Porter a pound-for-pound superstar, nor does it make him one of the big names in boxing. But it does make him a person of interest in a competitive 147lbs division and considering he started the year being considered an exposed prospect that’s a damn good rise. Only a fool would have doubted Rigondeaux’s talent… one glance at his amateur achievements and the magic he’d conjured in some of his early bouts would have told an observer that we were dealing with someone special. But there were questions about whether the Cuban could translate that success against lower level opposition to success against the elite in the division. He’d had some impressive performances against the likes of Willie Casey, Teon Kennedy, Rico Ramos and Robert Marroquin but those men weren’t truly world class opposition and he’d been wobbled in a few bouts. Memories remained of his only bout with a top level opponent, a boring split decision victory over Ricardo Cordoba where Rigondeux looked good early and then appeared to lose interest. So Rigondeux had a lot to prove when he finally stood across the ring from the pound for pound rated consensus 2012 boxer of the year Nonito Donaire in April 2013. It wasn’t thrilling but it was masterful. Rigondeux was too quick, too skillfull and too good for Donaire who despite managing to floor Rigondeux late on with a hook never managed to get a foothold in the match or find any sustained success. At times the ex-Olympian made Donaire look foolish, picking apart his mistakes and dissecting him. Rigondeux had arrived. Bob Arum claims that television networks are reluctant to show Rigondeux due to his boring reputation, while Rigondeux claims that Arum is reluctant to go to bat for him because he beat one of Arum’s favourites, but whatever the cause Rigo was only able to box once more in 2013. 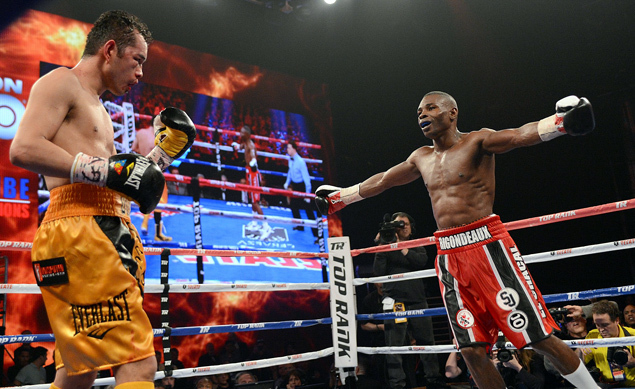 Joseph Agbeko may be faded from his 2009/10 pomp but he is still a good pressure fighter who was willing to bring the match to Rigo… and Rigo was once again masterful in taking him apart to score a shutout victory that showed all that is sweet in the sweet science. At the start of the year one could question whether Rigondeux could turn his talent into results against the best. Now one can only question how exciting he is doing it. Gradovich follows a pattern of two others in this list, being a Russian born boxer who primarily lives and competes in the US and this year was given a chance and grabbed it by both hands. At the start of the year Gradovich was a prospect with a decent but unspectacular amateur record who was yet to have a step-up bout. 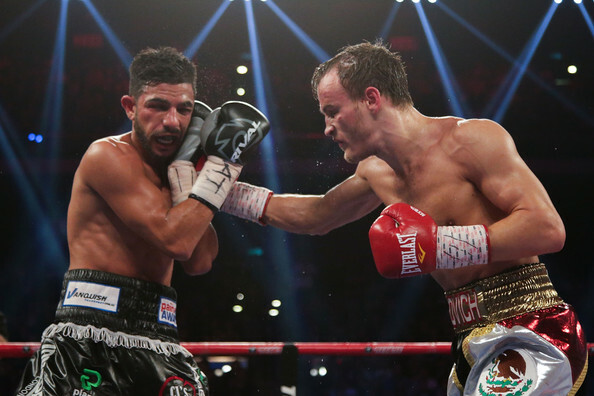 He ended it as the IBF featherweight champion with some entertaining bouts behind him. The man who fell so Gradovich could rise, the ying to Gradovich’s yang, was Australian champion Billy Dib. Dib needed a challenger for what was meant to be a showcase bout now that he was signed to 50 Cent’s new promotional company and dragged Gradovich out of obscurity to be the designated opponent. Skilled but somewhat underwhelming, most expected Dib to beat the unknown Gradovich with relative instead. Instead Gradovich outworked and outhustled Dib with a relentless aggressive style and while the judges had it far closer than any other observer (with one ludicrously thinking Dib had done enough to win), the Russian expat picked up an utterly deserved decision. After a routine win against limited Argentinian Mauricio Javier Munoz, Gradovich and Dib had a rematch as the chief support to the Pacquiao/Rios main event. And it went almost exactly the same as the first bout although this time Gradovich put a little more spite and a little more power into his shots, breaking Dib down and stopping him in the ninth while well ahead on every scorecard. Gradovich was pretty much an unknown name at the beginning of the year and he ended it as a world champion. That’s about as textbook a rise as one can see. If the previously mentioned Kovalev is partially responsible for the rise of 175lbs as an exciting weightclass then Stevenson can take just as much credit. The Haitian born, Canadian based power-puncher came into the year as a contender at 168lb but a long way behind the established names like Ward, Froch or Kessler and without really having had a signature win. Fans know of his physical gifts and power but he was still crude and still fairly lightly regarded. The year started well, with Stevenson avenging his lone loss by stopping journeyman spoiler Darnell Boone… but what makes him come to this list is what happened next. Chad Dawson was still the RING and WBC champion at 175lbs but was smarting from a one-sided loss to Andre Ward at 168lbs. Looking for a comeback opponent he pulled Stevenson up from 168lbs to face him. You may see a trend developing here, but most commentators, despite noting Dawson’s flaws, expected the athletic champion to be too quick and too well schooled for the seemingly flat-footed Stevenson. And once again, how wrong we were. After flattening Dawson in a single round, Stevenson then went on to show that a new age had come to 175lbs by dominating and then forcing to quit the big punching former champion Tavoris Cloud and then finished the year by hunting down and stopping fringe contender Tony Bellew in a bout where it seemed simply inevitable that Stevenson’s left hand would connect. While Stevenson was a massive favourite over Bellew, it’s worth noting that quite a few commentators thought that Cloud would be a really tough challenge for him; while Cloud could be outboxed many thought Stevenson lacked the nuance to do that and that it would be a much more difficult task to outfight the heavy handed “Thunder”. Being the RING champion… and then defending it… is a goal many boxers strive their entire career for without succeeding. Stevenson went from a fringe contener to that in less than a year… and was much improved as a boxer while doing so. Juan Francisco Estrada: Dropped down the list by relative obscurity of the lighter weight classes in the west, Estrada started the year coming off a loss to Roman Gonzalez in his first world title shot, but beat the pound-for-pound ranked Brian Viloria to win two titles and then defended them against Milan Melindo to cap a highly successful year. Paulie Malignaggi: Only moderately successful in the ring (going 1-1 with a narrow but in my mind clear loss to Broner and a victory over a faded Judah) Malignaggi’s rise has come largely down to his work as a commenter and analyst for Showtime. We’ve always known he had a fast mouth but the commentating has brought his insightful analysis and a remarkable lack of bias to a much wider audience. Erislandy Lara: Like his compatrior Rigondeux, Lara’s talent has never been in doubt but his ability to translate that talent has. While his “loss” to Paul Williams was a shocking robbery there was little controversial about his draws with Carlos Molina and Vanes Martirosyan. But Lara started 2013 by winning a highly entertaining war with Alfredo Angulo and ended it with a wide decision victory over the awkward but highly regarded Austin Trout. Carlos Molina: Watching him box might be as boring as watch paint dry very slowly, but the grab happy Molina went from a spoiler who gave prospects and contenders a tough night before normally losing to a world title holder with victories over Corrie Spinks and Ishe Smith. Just don’t waste your time by watching the bouts. Simpiwe Vetyeka: In a single year the South African destroyed Indonesian boxing, first stopping Daud Cino Yordan and then shockingly defeating Chris John. Jhonny Gonzalez: Much like Estrada, Gonzalez lost his last bout in 2012 and was considered past his best. Yet after two keep busy bouts he beat a pound for pound level fighter on a great run of form, in his case shocking stopping Abner Mares in a single round. George Groves: Having had his career get a shot in the arm through a victory over domestic rival James Degale, George Groves saw his career flounder through a lack of activity and underwhelming opposition. Having signed with Matchroom Sports, Groves had three tune-ups against limited opponents before facing Carl Froch. While he controversially lost the bout he showed that he could compete with the elite 168lbs boxers and saw his reputation significantly enhanced. 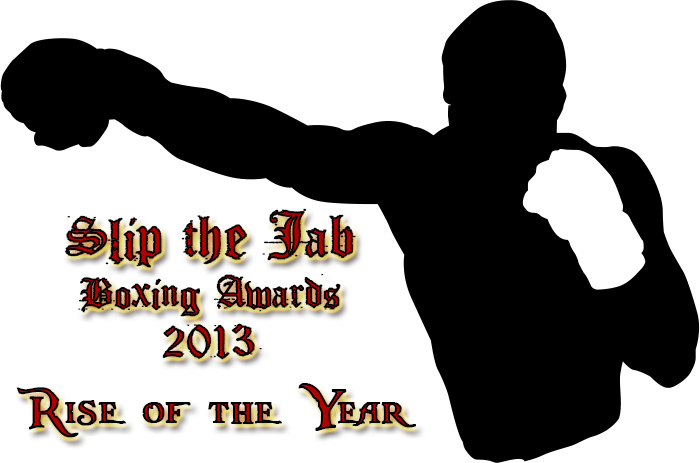 This entry was posted in Analysis, Boxing, Slip the Jab Boxing Awards, Slip the Jab Boxing Awards 2013 and tagged Adonis Stevenson, Boxing Awards, Boxing Awards 2013, Boxing End of Year Awards, Boxing End of Year Awards 2013, Carlos Molina, End of year Awards 2013, End of Year Wards, Erislandy Lara, Evgeny Gradovich, Guillermo Rigondeaux, Jhonny Gonzalez, Juan Francisco Estrada, Paulie Malignaggi, Rise of the Year, Rise of the Year 2013, Ruslan Provodnikov, Sergey Kovalev, Shawn Porter, Simpiwe Vetyeka, Slip the Jab Awards, Slip the Jab Awards 2013 by consortium11. Bookmark the permalink. Jeff Horn (Australia) – Pro debut March 2013 finished the year 7(5) 0 + 1 Tech Draw (Acc Head Clash R3) ending the year with UD defeat of world class and IBF ranked Ben Rabeh. Horn is a superstar who is destined for international stardom in the welterweight division. As for whether it’s the rise of the year… I had such high expectations of Horn after seeing him as an amateur that I wasn’t surprised that he did so well. Taking on and defeating Rabah so early in his career was a pleasure to watch but to be fair here Rabah is a long way removed from his glory days back in 2006/7. I’m clearly in the Stevenson bandwagon here. As you pointed out the guy fought a lot, achieved a lot and his rise wasn’t as expected as Rigondeaux’s confirming his superstar status. Even if Kovalev also went 4-0, his biggest win of the year is smaller than Stevenson’s. Provodnikov certainly upgraded his status in a spectacular way, but he still went 1-1. Both Porter and Gradovich are certainly worth mentionning in this debate (and I do like both guys), but they both fall behind Adonis in terms of record and visibility. I want to make it perfectly clear that I’m far from being a fan of Stevenson’s previous extra-curicular activities, but as long as boxing goes this pretty old fella should be the rise of the year.